These days we're shipping scads of liners (AKA lining-out plants), and that's a good thing because I wouldn't know what to do with them all. We don't custom propagate like we did years ago, back when I employed forty earnest souls and we supplied the best growers in Canada and America with new and wonderful maple and conifer grafts. 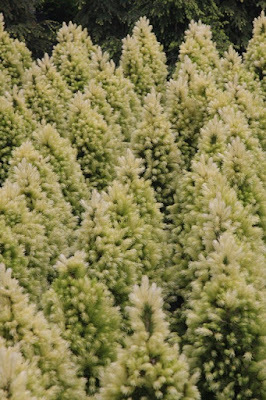 We were highly instrumental in putting Oregon's nursery industry on the map and in putting millions of dollars into state coffers, although no elected official has ever thanked me for it. We are no longer renowned for our rooted cutting program; heck, it's my office manager that is in charge of that now, and he tends to over mist and rot to death half of what's in the propagation house… and just as well, or we would have too many of those plants too. But we're still pretty good at grafting, and the past two years with Juana in charge have been exceptional. For every three plants we graft we need to sell one – if not two – as liners so that (as they become large) they don't overwhelm our smaller crew and our limited facilities. 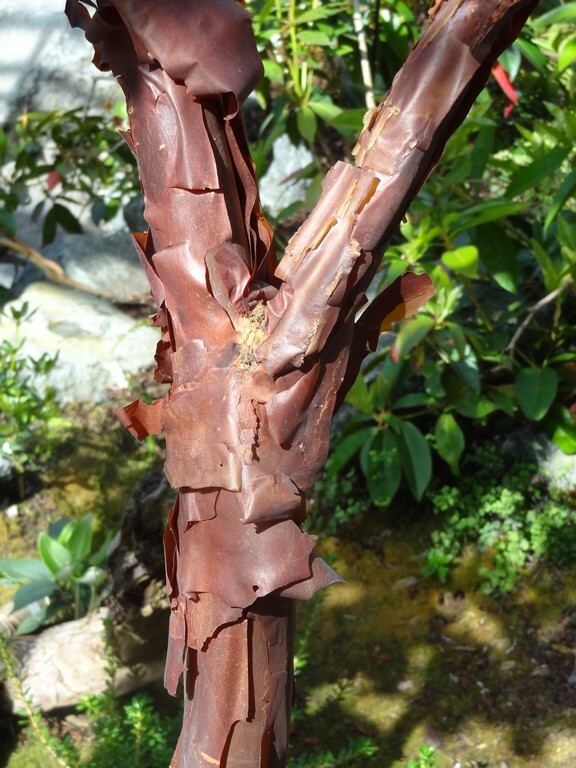 So, even though we are no longer custom graft, we continue to over propagate beyond our grow-on needs, and I view the overage as speculation propagation. 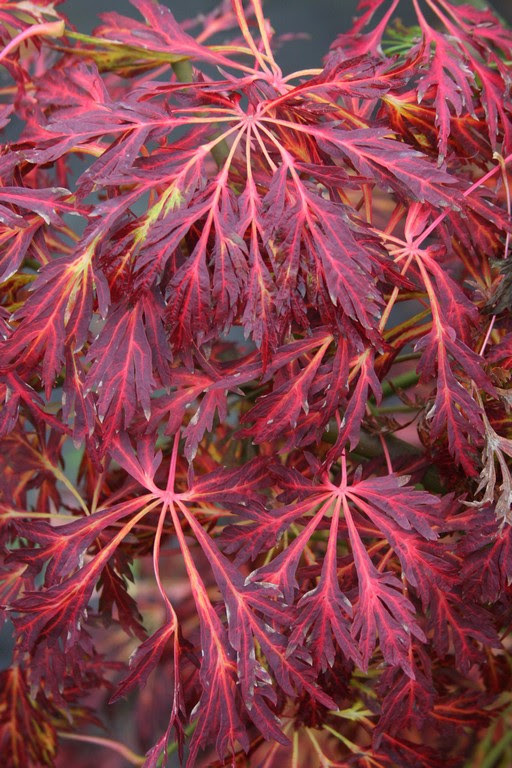 There is no exact science as to what will sell as a liner – or at any size – and even though we have been able to sell 100% of our extra Acer palmatum 'Japanese Princess' for the past three seasons, there will likely come a time where these spendy items will be passed over. Nobody will give me any warning that this will happen, and then it is quite possible that the following year we will sell out again. What is funny is that I have some employees who assume that I know exactly what I am doing, and I think it would demoralize them if they knew the extent that I do not. 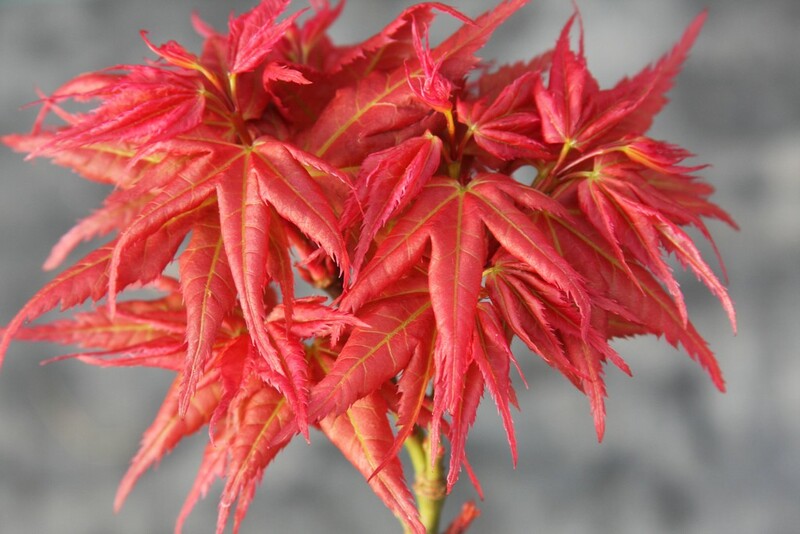 A sister to 'Japanese Princess' is Acer palmatum 'Mayday', and they were both seedling selections from the huge mother plant of 'Mikawa yatsubusa' growing along the main entrance to the nursery. 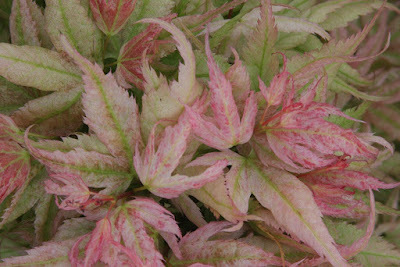 Both 'Japanese Princess' and 'Mayday' display the same short internodes and small overlapping leaves as their mother, but the former boasts pink foliage in early spring, while the latter features a blonde coloration. 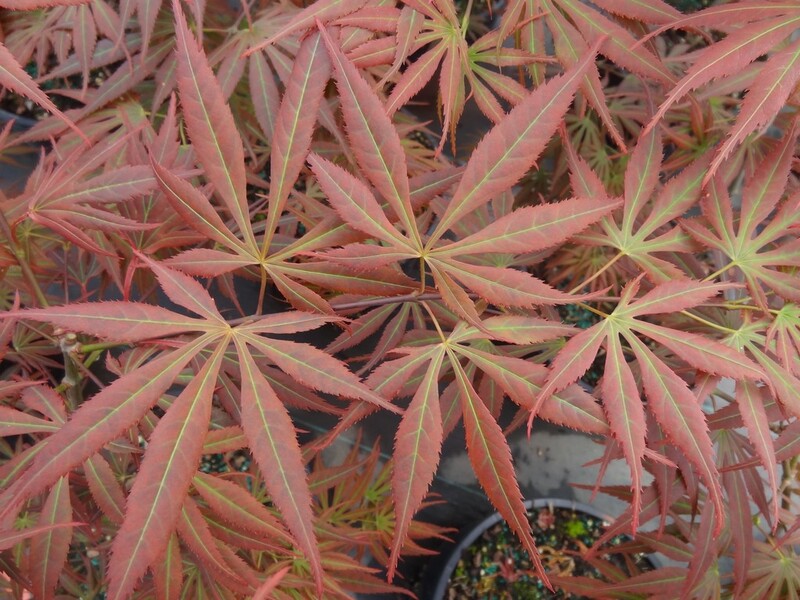 I have raised a few thousand of these sorta-look-alikes to 'Mikawa yatsubusa', while the remaining two-thirds of the seedlings are strictly “palmatum” in nature, and they are utilized two years later as rootstock. 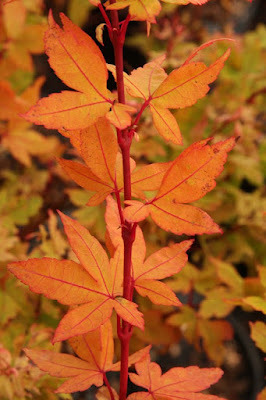 It is fascinating to observe the diverse offspring, and a few times we'll even find variegated uprights and laceleafs. For me money would absolutely buy happiness, and if I had tons of it I would abandon my nursery business and raise seedlings solely for the fun and knowledge of it. I would surround myself with highly motivated and attractive Japanese graduate students wearing white lab suits who exhibit great zeal for maples. Anyway, all of the 'Mayday' on the Liners Ready Now list were snapped up on the first day. 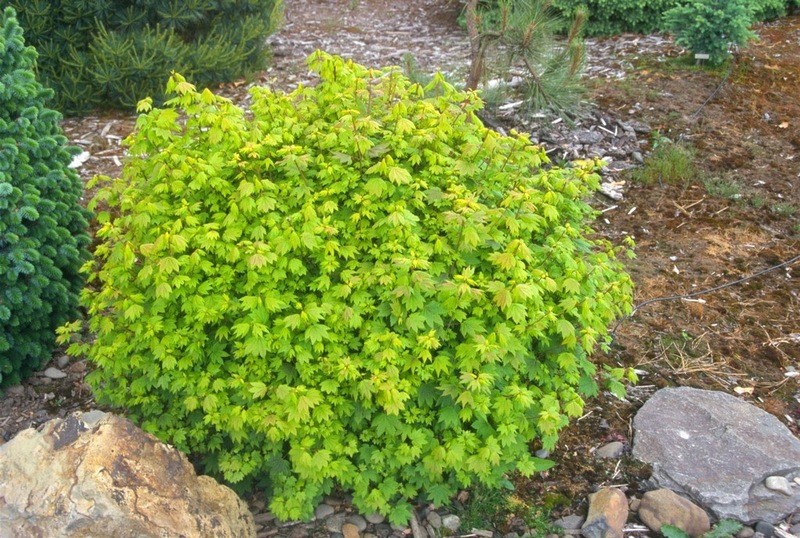 Also making a quick exit was Acer circinatum 'Baby Buttons', the most-dwarf “vine maple” known to date, and a cultivar which originated as a witch's broom mutation on a wild tree growing next to a busy interstate highway. This cultivar was discovered by an employee of Buchholz Nursey, then propagated, named and sold a few years later. What is remarkable is that the grapefruit-sized mutation was spotted at all, when the average car speed is between 65-75 MPH. 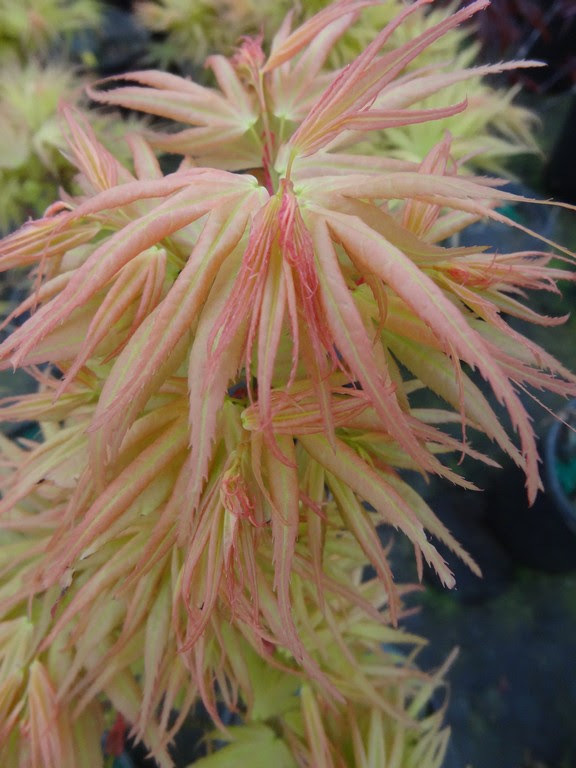 Another maple-selling nursery was told about the witch's broom, and they propagated also, except at a later date than Buchholz Nursey, and their (unofficial?) 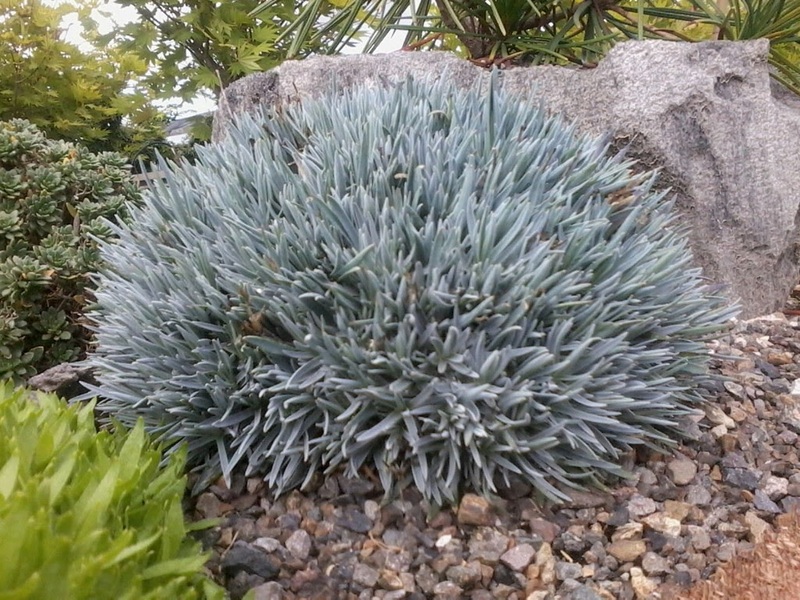 name for the plant is 'I-205 Interchange' – or a name something like that. Just so you know these two would be the same clone – so no need to collect both – but the 'Baby Buttons' epithet would take precedence. As with all of the witch's broom-originating circinatum cultivars, such as 'Little Gem' and 'Alleyne Cook', plants grown in a greenhouse, especially when young, will put on considerable growth, and the novice grower might conclude that they're really not so dwarf. But when planted out in the “real world” 'Baby Buttons' will delight you with how tiny the leaves can be – usually only one-half inch wide – and that a dense ten-year-old plant will not exceed the size of a basketball. 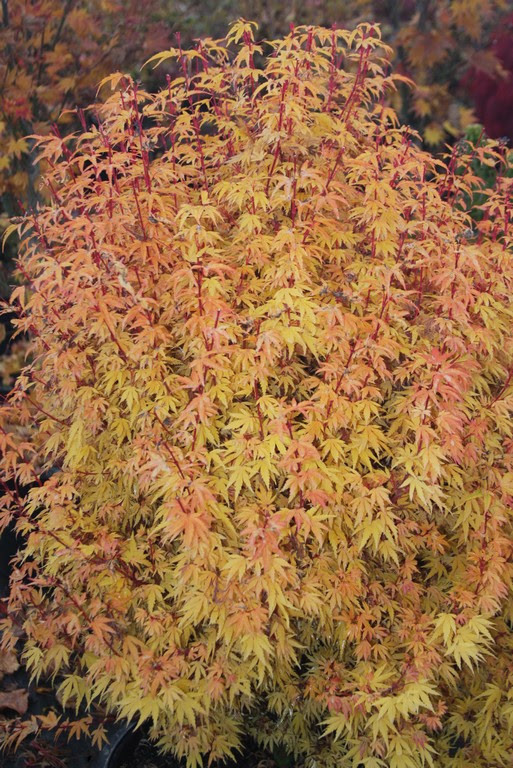 Sadly the circinatum species, even though grafted onto Acer palmatum rootstock, does not perform well in most of the humid central and east coasts of America, so hopefully the buyers of my 'Baby Button' starts will market them in climates where they'll succeed. 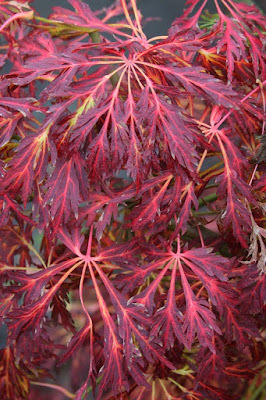 Another sell-out from a witch's broom origin was Acer palmatum 'Little Sango'. I saw the original broom in an Acer palmatum 'Sango kaku' and it was a crummy thing with a lot of dead wood, and I wouldn't be surprised if it's entirely dead now. Fortunately the original scions thrived as they were grafted onto vigorous green palmatum rootstock, and now the relatively new cultivar is firmly established in maple collections. The best thing about these dwarf winter red-stem cultivars, such as 'Fjellheim' and 'Winter Flame' in addition to 'Little Sango', is that you can look down at them, or sideways at them, so that the coral twig color is most obvious in winter… as opposed to the large-growing forms such as Acer palmatums 'Red Wood', 'Beni kawa', 'Japanese Sunrise' etc. that display their red new growth high in the sky, and as these trees age they become less impressive. As we were growing and building up our stock of the witch's broom I found myself calling it 'Little Sango', and somehow the name stuck when I sold my first plant of it. I admit that it now goes by an inappropriate name, that little – an English word – should not be combined with the Japanese word sango (“coral”), as such international language combinations are “outlawed” by the accepted rules of nomenclature. Usually I am a stickler for these conventions even though I sometimes find myself preaching about , but not always adhering to the rules. 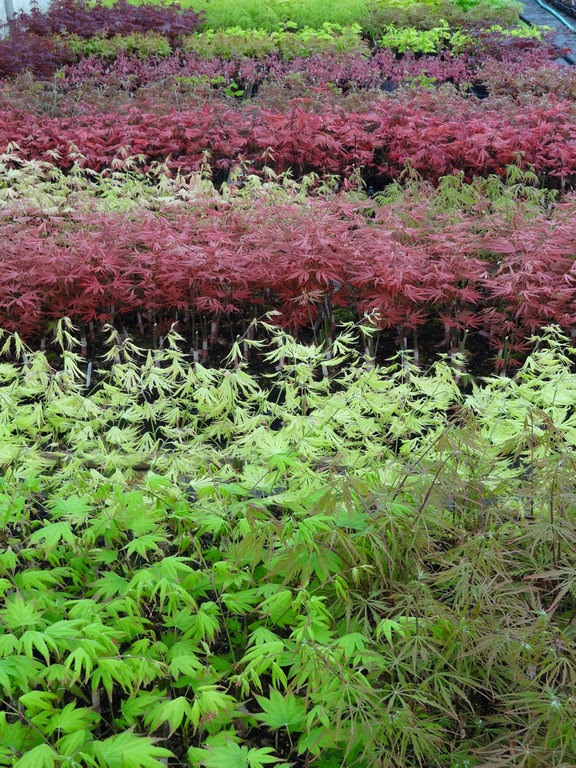 Last summer we didn't propagate many Acer japonicum cultivars, and the reason was that our stock plants just didn't yield good quality scionwood. Often times the terminal buds swell up and shoot new growth at the same time that we want to propagate. I would have grafted a couple of hundred A. j. 'Abby's Weeping', for example, but after pawing over the stock plants I wound up cutting nothing. Only one hundred A. j. 'Aconitifolium' grafts were successful, so I put sixty up for sale. I was actually disappointed that they were quickly purchased, as that leaves (no pun intended) me with only forty (of a smaller size) to grow on. The liner customers always get the best quality, per instruction to my employees, but the manager of the liner sales department, and the manager of the grow-on sales department are seldom in agreement, and both vie to prevail. Those who are familiar with Buchholz Nursery know that I head both departments. 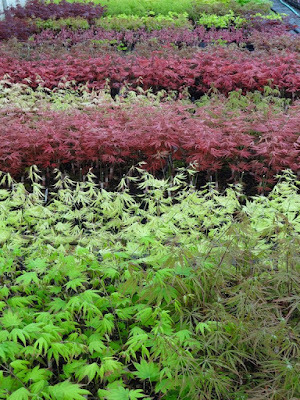 'Aconitifolium' – with leaves like the perennial genus Aconitum – has to be one of the worst cultivar names in Japanese maple history, but the Japanese epithet of 'Maiku jaku' – or “dancing peacock” – is one of the best and most appropriate. 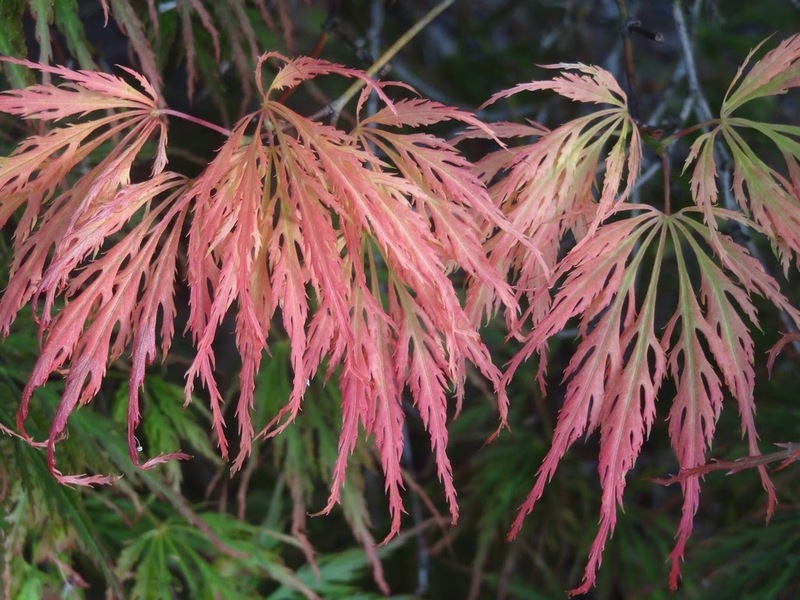 'Aconitifolium' used to be called 'Laciniatum' or 'Filicifolium' and these old Latin names are sure clues that the cultivar has been around a long time – since 1888 – and the Vertrees/Gregory Japanese Maples book even indicates that it once went by the name of 'Veitchii'. Many of our larger specimens wind up in Midwestern American gardens where a sturdy and hardy tree is required, and though 'Aconitifolium' is ferny and pretty in spring, its dependably dramatic autumn colors of orange, red and purple are why it has become a mainstay. I have even seen it with marvelous autumn color in rainy olde England at the Westonbirt Arboretum, and that is a place where not every maple species – such as Acer saccharum – will color. 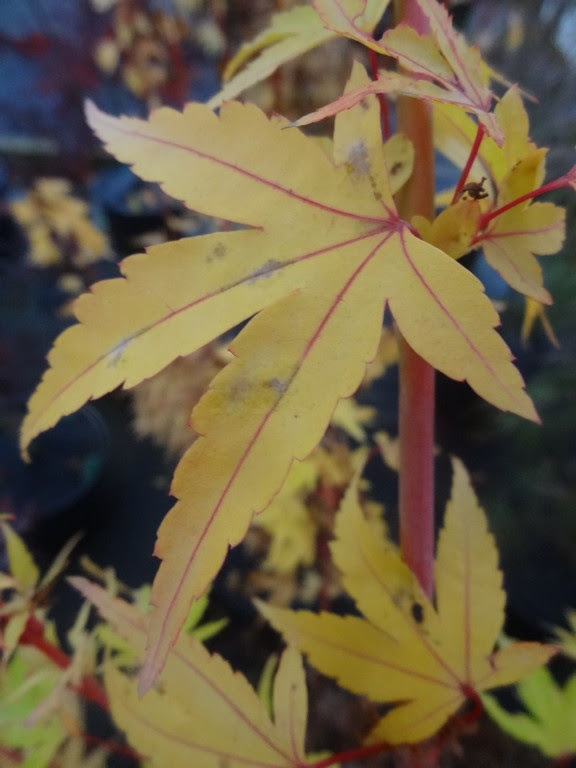 I was a little surprised that all the Acer palmatum 'Orange Dream' disappeared from our Liners Ready Now list as I previously suspected that the cultivar was falling from favor. Selected and introduced by the Gilardelli Nursery of Italy in the late 1980's, we initially sold large amounts of liners and larger specimens as well. 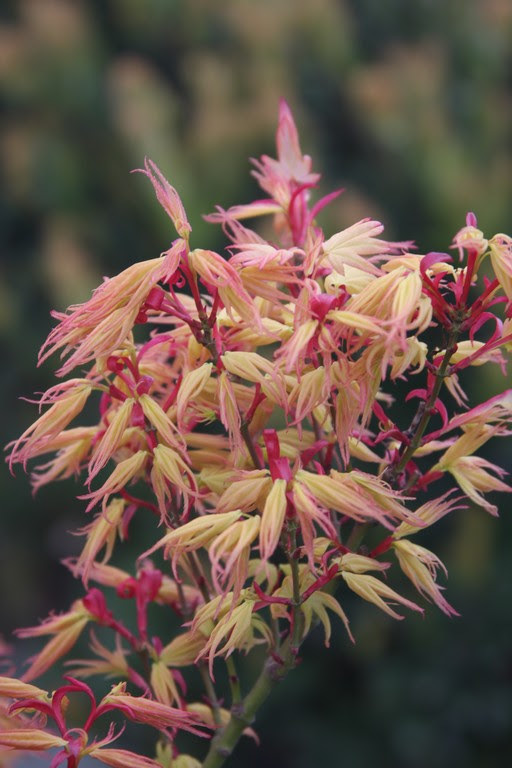 'Orange Dream' is a fantastic beauty in early spring with fresh orange foliage that soon turns to yellow with some orange on leaf margins and tips. 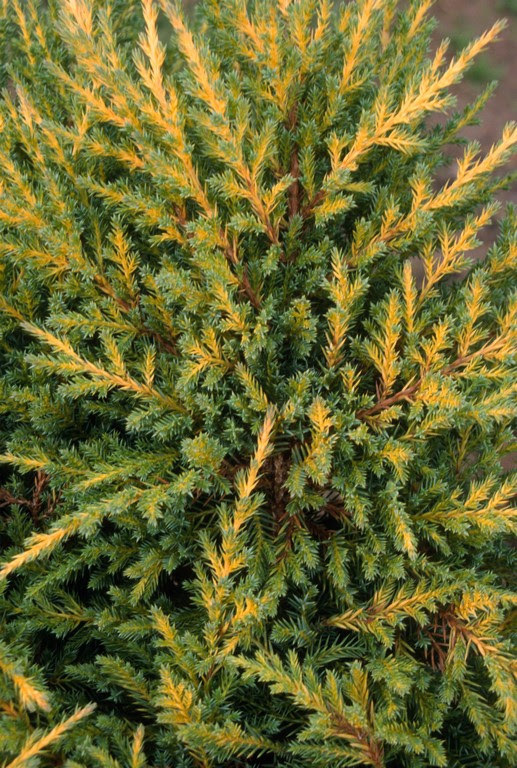 "Orange Dream" is a catchy, very commercial name, but inevitably growers and collectors wondered why it wasn't called "Lemon Dream," or something else, as the orange coloration was so brief. I also attributed slower sales to the fact that 'Orange Dream' will burn in full sun in Oregon due to our lack of humidity, though no doubt it performs better in other regions of the United States. 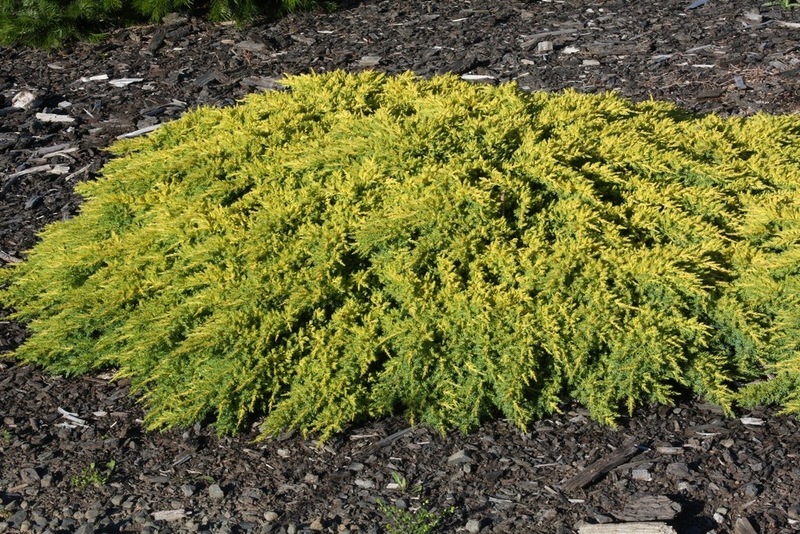 Another problem is that it is an extremely vigorous bush when happy and well watered, and so it never stops growing in late summer and into the fall. Thin soft shoots can soar to five feet in length, and thus they are susceptible to die back during hard early frosts. So I was happy that all of the liners sold, but I don't think that we'll produce a greater number this coming year. Better to be safely sold out than overstocked is my conservative approach. 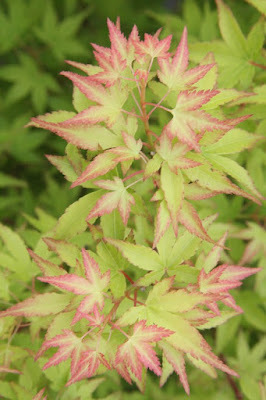 All of the Acer pictum 'Usu gumo' sold out quickly, and we are doing our best in making this variegated cultivar not so rare in collections. 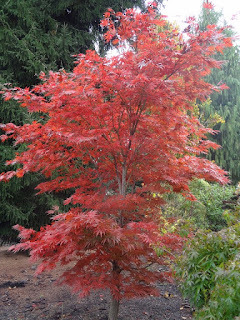 I received my start 35 years ago from Howard Hughes – not the late billionaire pilot and movie tycoon, but rather a maple collector from Washington state who helped J.D. Vertrees with his collection. Hughes was 90 years old at the time and I remember him mainly for his kindness. Anyway, 'Usu gumo' is a slow-growing cultivar, and even though it's leaves are more white than green, it can withstand full sun in Oregon. 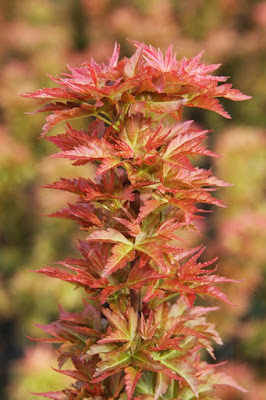 It is a sturdy cultivar that is hardy to - 20 degrees F, USDA Zone 5. 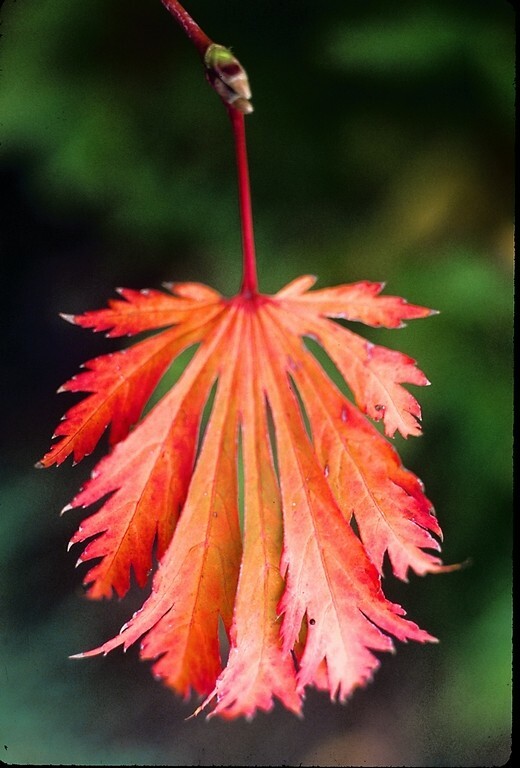 The nomenclature can be confusing as some authors, such as de Beaulieu in An Illustrated Guide to Maples, do not even list the Acer pictum species, and instead they assign 'Usu gumo' to the Acer mono species. Hillier goes with the pictum designation and so does Vertrees/Gregory in Japanese Maples*, the latter referring to the common name of the "Painted maple" for the species. V/G justifies the pictum name by declaring, "The older name of A. pictum has now been accepted as legitimate by the International Botanical Congress, and so it takes precedence over A mono." 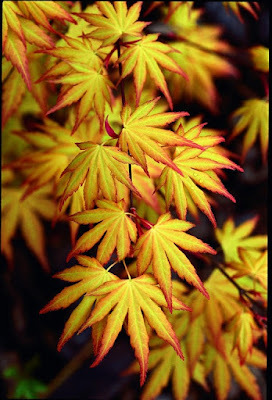 *I don't mind authoritative reference books, such as Japanese Maples, to make subjective pronouncements. I'm ok with opinions like "useful in the landscape" or "beautiful in the fall" etc. However, I am critical of limited -experience being offered as fact, as in the statement, "It ['Usu gumo'] is difficult to propagate and not widely known in collections." That is not my experience: If scionwood is collected from young healthy plants, and if the rootstock is in vigorous mode, then the grafting success rate can be 90% or better. 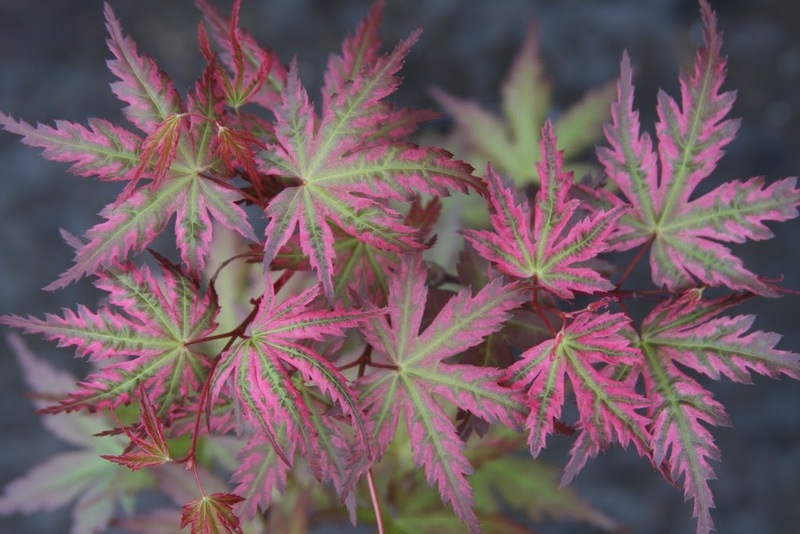 Another example is with Acer palmatum 'Goshiki kotohime' , where it is called "quite difficult to propagate because of the lack of vegetative growth. " Well, young healthy plants –especially if grown in a greenhouse – do not lack vegetative growth and they graft and root "quite" easily. One aspect of Buchholz Nursery that makes me proud is that we are a fun nursery. I don't necessarily mean that I or my employees have lots of fun – we work hard and worry a lot, after all – but that the nursery is a fun place for visitors and customers. We sell fun plants, cool plants. 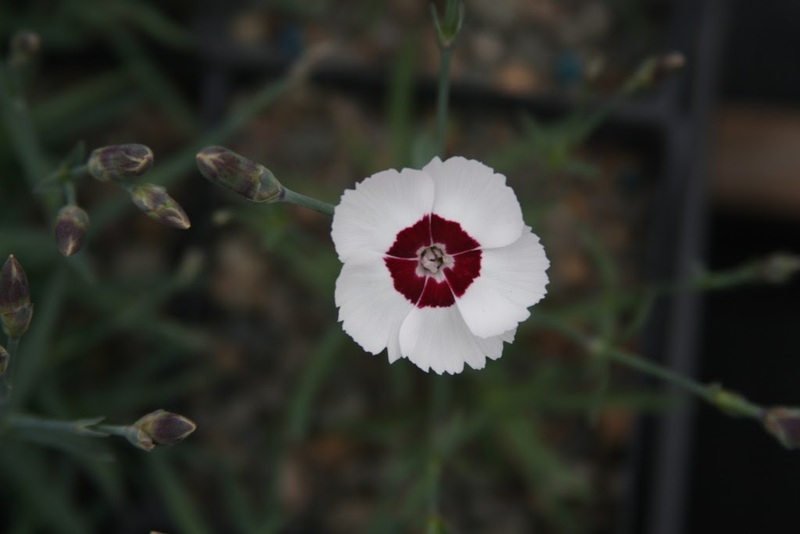 Take the Dianthus genus for example: we like the tiny bun cultivars that produce vivid flowers. D. 'Blue Hills' , 'Dainty Dame' , 'Inshriach Dazzler' and 'Little Joe' are a few that have sold out. 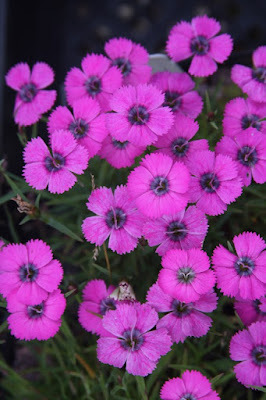 In old times Dianthus was known as the "Carnation" and the species D. barbatus was called "Sweet William." The generic name is a Buchholz favorite, as it is derived from the Greek words Dios meaning "of Zeus" and anthos for "flowers," and it was coined by the botanist-philosopher Theophrastus* – a contemporary and successor of Aristotle. 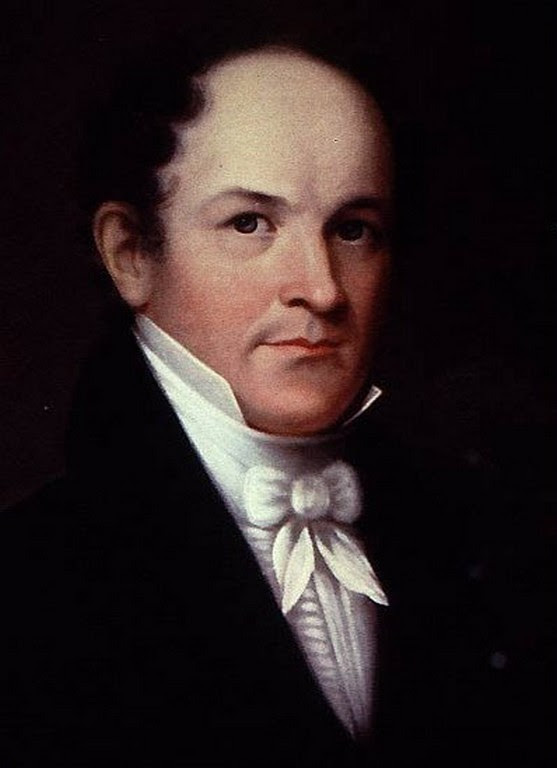 Theo's name was allegedly bestowed by A. and means "divine expression." He – Theo – once remarked that "We die just as we are beginning to live," but his great honor was that A. made Theo guardian of his children, and also bequeathed to him his library and the originals of his works. 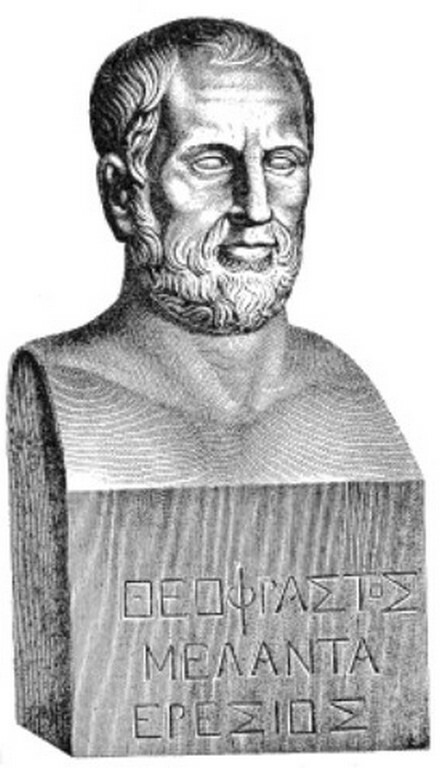 *The persona of Theophrastus is one that I have studied in great detail, and I would love to comment on his life and share with other plant enthusiasts his intelligence and accomplishments. I have always felt inadequate to do so, however; but what an honor and insight it would be to have walked a mile in his dusty sandals! 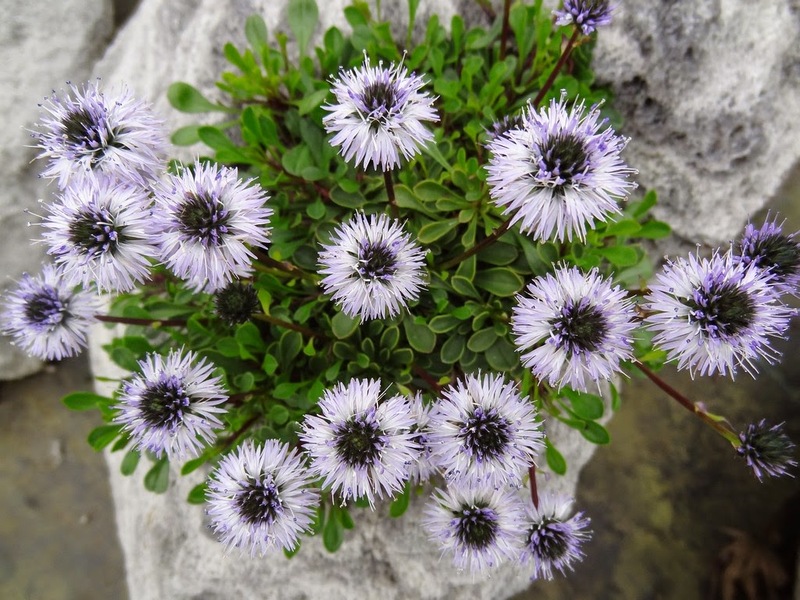 Also exceedingly fun is the Globularia genus. We sold out of the species cordifolia (for "heart-shaped" leaves) and repens (meaning that it forms a low evergreen perennial mat) The flowers are cute daisy-like balls that rise above the foliage. We sell them as individual pots or include them in our alpine troughs. I know very little else about them, except that they are easy to grow, and I wished that this past year we would have propagated more. No less fun are some conifers we grow, and apparently we have customers who feel the same way. 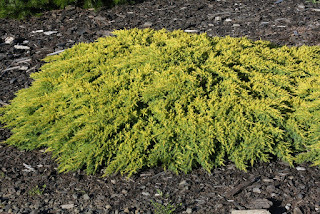 Gone are liners of Juniperus chinensis 'Daub's Frosted', the yellow-green variegated low-spreader that made me a fan of the “Chinese juniper” after all. The problem is that I previously loaded thousands of its prickly brethren – the pfitzers especially – into trucks when I worked for a large (commodity-boring) company in the 1970s and 1980s. My forearms would rash with juniper contact, but the worst part – trapped in the interior of an east-coast-bound trailer – was the abhorrent smell of the junipers combined with the pungent sick-sour breath of the Korean interns who had just finished their garlic-laden lunch and who were helping me to load the truck. Thank you, Korea, for the cultural – if nauseating – “exchange” experience. But anyway, in spite of its ancestors and relatives, 'Daub's Frosted' is a most garden-worthy conifer. 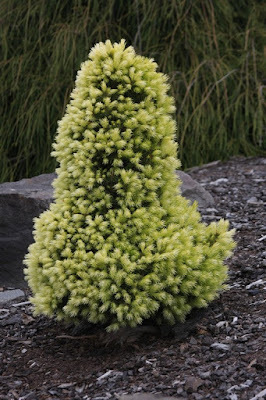 Another conifer that sold out with reckless abandon was Picea glauca 'Daisy's White'. This is a dwarf “conica” cultivar noted for cream white new growth on an otherwise boring gray-green evergreen pyramid. 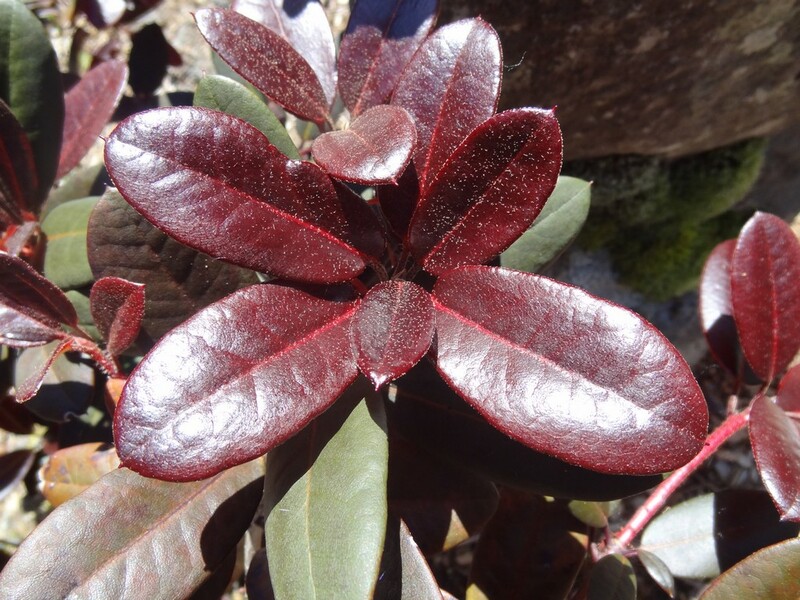 The fresh new growth is spectacular, however, and even non-plant people are very impressed. The middle-aged mail lady, for example, prefers to hand-deliver the larger packages to our office door rather than make me go to the post office. Obviously she desires to interact with me, but also she is visibly impressed with our colorful conifers… and she would likely deliver even without me. Ok, enough… my daughter must type this blog and she (Harumi) concludes that I have gone on way too long. I really shouldn't brag that sales have been so great, but for certain lining-out plants they really have been excellent. Not so with everything, but at least Buchholz Nursery continues…and who knows how far we'll go? Flora: "I don't know, Talon, but it really does sound like you are bragging about great sales." Talon: "Look Flora, you are always worried that I take too much credit for my plants and sales. Yes, I remember that you bestowed them on me in the first place." 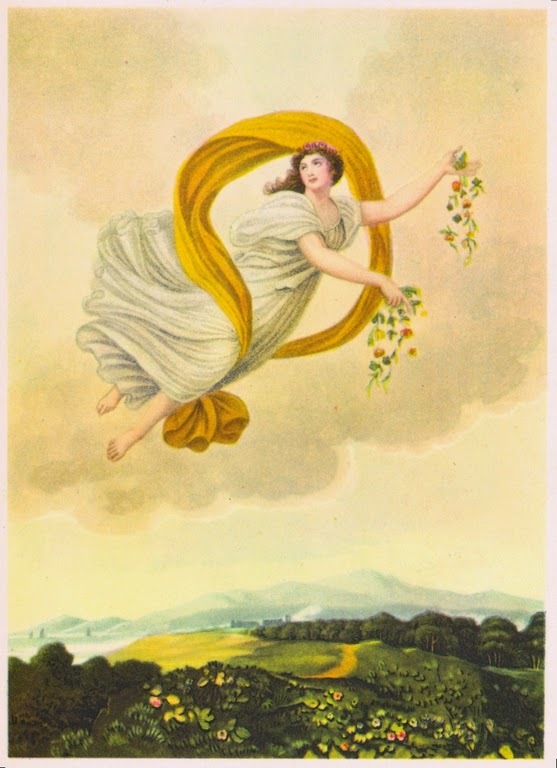 Flora: "Good, or else I might start looking for a younger nurseryman." I don't suffer assignments gladly. Being told that I need to do something or decide on something instantly can irk me – like a non-listed plant, "is it for sale and how much?" Or, so and so needs a photo of this $50 tree to make sure it meets his client's expectations. Damn, it's winter and raining and the plant in question is jammed into a row with others – if we can find it at all – and a photo won't do you any good anyway. I grumble but then usually oblige. Likewise, writing plant descriptions for labels, or to fill out our website descriptions can be a tedious task. I must give a brief synopsis that highlights the basics like winter hardiness, whether to plant in sun or shade, what is the autumn leaf color etc. The problem is that I don't always know. Maybe I've only had the plant for a couple of years, so I don't really know how large it will get. 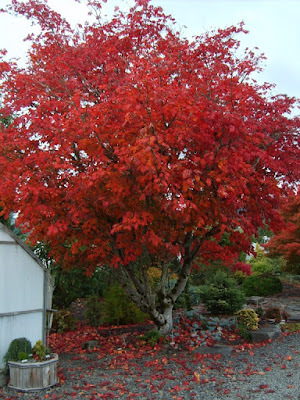 I especially cringe when I pronounce the winter hardiness, and I wonder if a new maple like Acer shirasawanum 'Mikado' can actually survive at -20 degrees F, USDA Zone 5 as I say. Furthermore I admit to cheating when I say that it will grow to "10' tall by 5' wide in 10 years," because my tree is already 12' tall in 8 years. I deliberately tone down the size because most gardeners in the various regions of the United States are not as privileged as we are in western Oregon with our delicious soil and plentiful water and our benign climate, and their specimen will never grow as fast as it does in my garden. Anyway, in spite of my aversion to writing plant descriptions, I spent Sunday catching up on new acquisitions, even though many of them might never make it to a sales list. One such would be Allium beesianum. 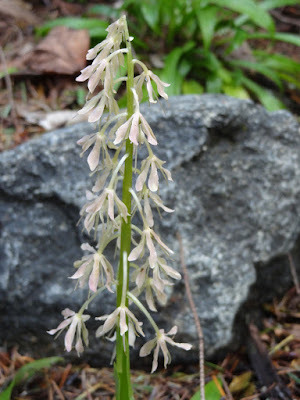 My description gives the common name as "Beesianum Chinese Onion." In clipped label-friendly sentences I write, "A Chinese perennial native to slopes and meadows at altitudes of 9000-13,000'. Green grassy leaves form mounds and are topped with small blue flowers in summer. Prefers sun/partial shade in well-drained soil. 8" tall by 10" wide in 10 years. Hardy to -20 degrees F, USDA Zone 5." 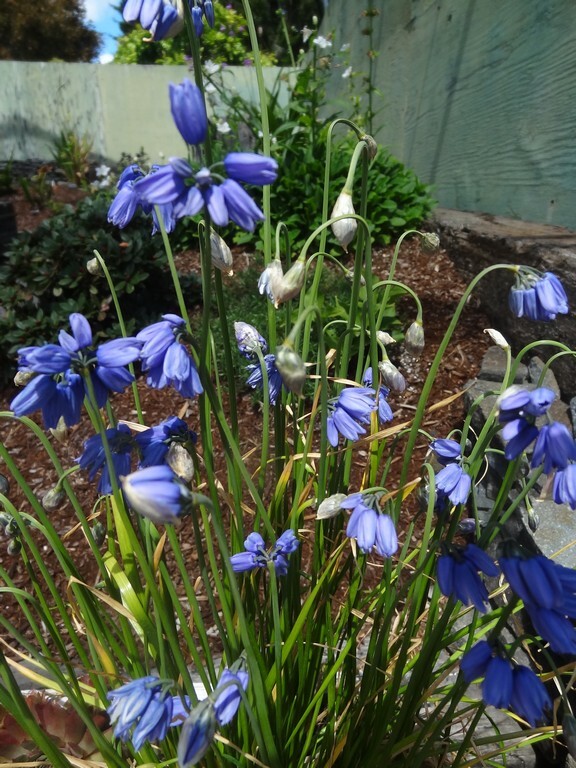 Due to space limitations I cannot elaborate to mention that A. beesianum, from Yunnan and Sichuan – an area where I have generally been – is one of the few true blue-flowered Allium species, that there is only 17 species out of 850 Allium species with the blue coloration. Also, it blooms in late August to September when little else is in flower. 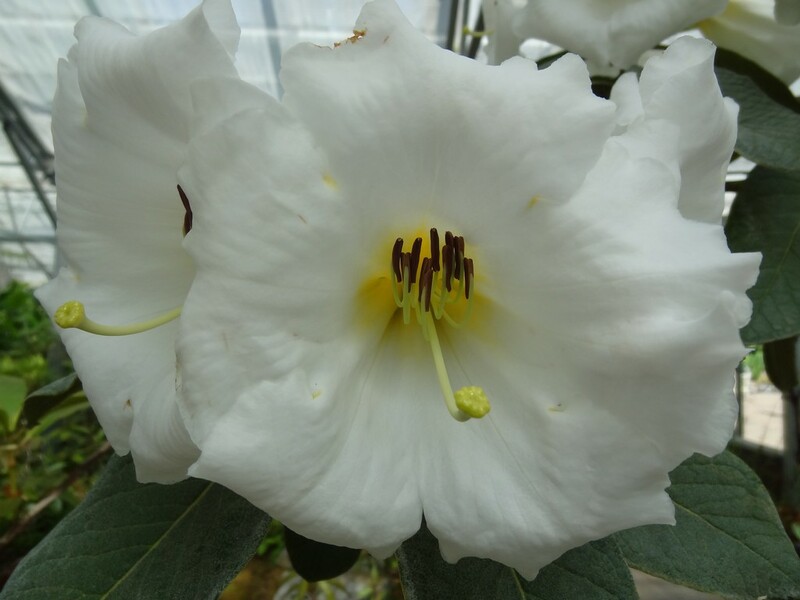 The plant was first classified in 1914 by Scottish botanist Sit William Wright Smith (1875-1956) and was named for the Bees Seed company founded by Arthur Bulley (1861-1942), a rich cotton merchant from Cheshire. 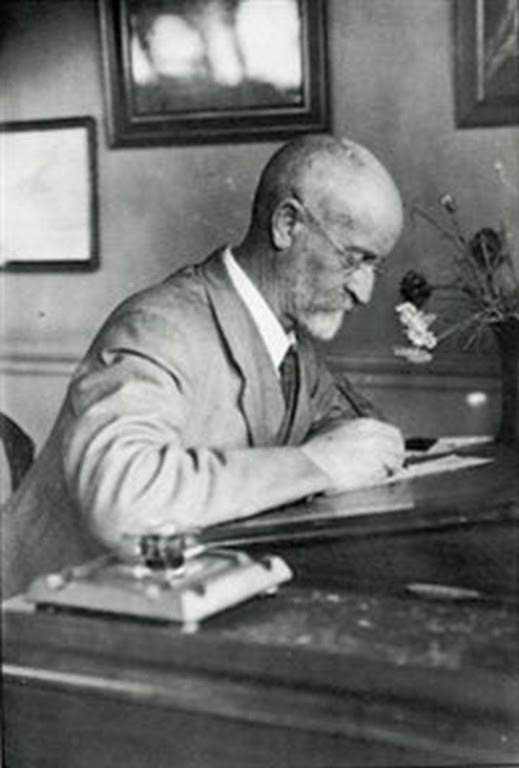 Bulley* used his wealth to good purpose, employing the likes of George Forrest and Frank Kingdon-Ward to collect plants from South America, China and Africa for his garden – The Ness Botanic Garden – which still exists upon a conditioned trust to the University of Liverpool. 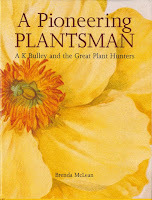 In my library is A Pioneering Plantsman: A.K. 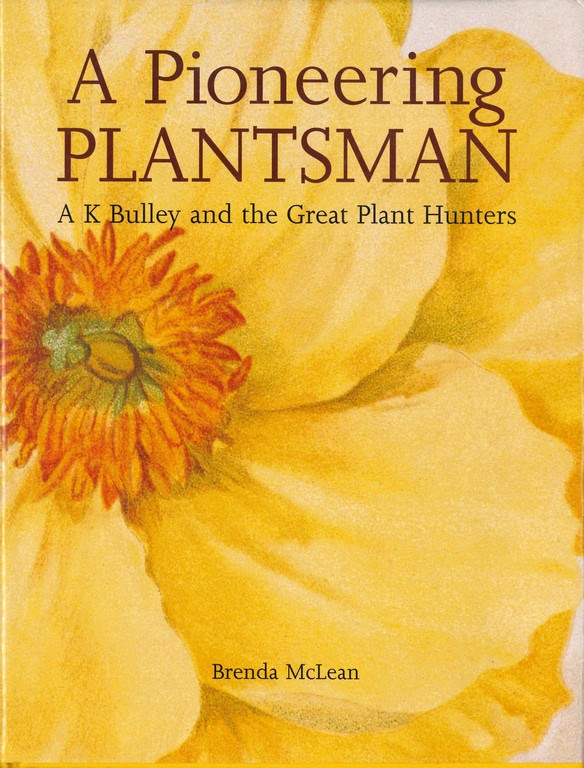 Bulley and the Great Plant Hunters by Brenda Mclean, so you can see that when my pretty onion blooms I am reminded of the golden years of plant exploration. I take no plant in my garden for granted; every one of them has a story, and it adds immensely to the pleasure of a plant when you know something of it's history. And by the way, I don't truly know if the A. beesianum is hardy to USDA Zone 5, as I have read, because I also see from another source that it is only hardy to USDA Zone 7, and that difference would spell survival or death of the onion for most of the American gardening public. 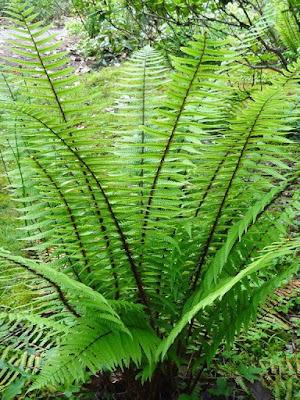 Another description that I cranked out was for Dryopteris wallichiana, or "Wallich's Alpine Wood Fern." I explain that it's "a semi-evergreen fern native to the Himalaya, Hawaii and Mexico. 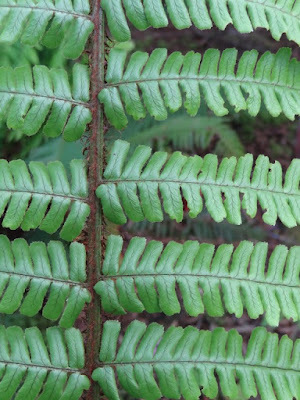 Light green fronds contrast with dark brown ribs. Prefers sun/partial shade in well-drained soil. 3' tall by 3' wide in 10 years. Hardy to -20 degrees, USDA Zone 5." As you can see, my description is in the same format as that for Allium beesianum, and I can almost write these in my sleep. How accurate they are is another matter, but certainly they are quite forgettable. I planted the Wallich's fern in the fall years ago but it perished when we experienced an arctic blast of 0 degrees F and 30 mph winds the following winter. After 20 years I have replanted another and at least it survived last winter. 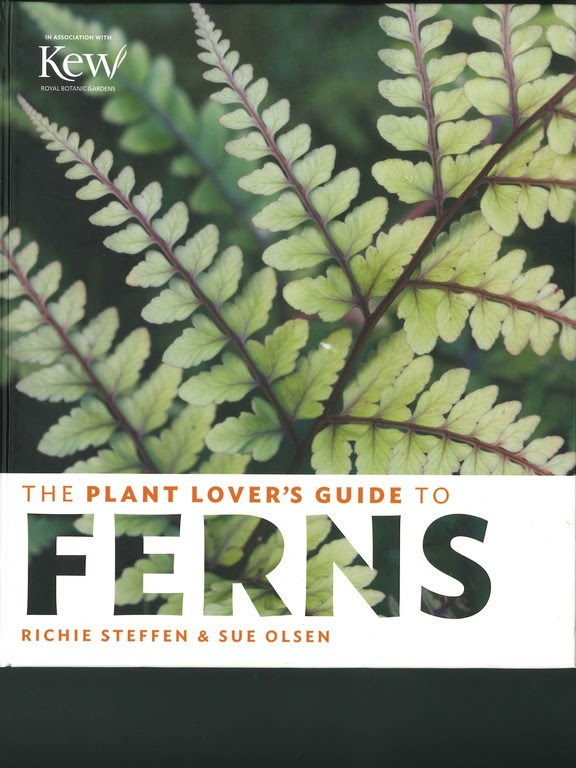 As an after thought, after my label description was completed, I pulled Richie Steffen and Sue Olsen's The Plant lover's Guide to Ferns from the shelf – which I should have done originally – and find that they list hardiness to zones 6-8. They're the experts, so go with zones 6-8! But the best part of their fern book is the poetry, at least for me. For Distinctive Features I read, "Warm, butter yellow, arching foliar pinnate – pinnatifid plumes erupt in mid to late spring from an erect rhizome." Wow, warm erupting plumes! 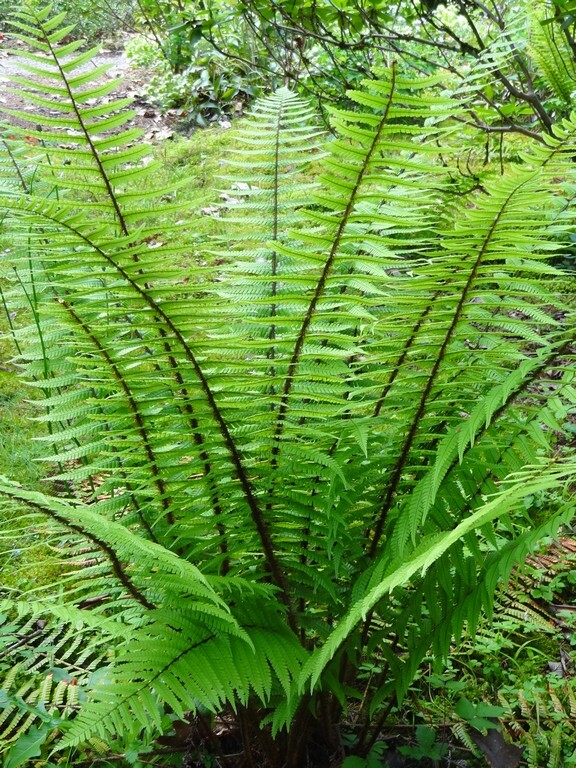 Who then, wouldn't want to grow Dryopteris wallichiana? If I acquire a new plant from a company such as Far Reaches Nursery in Washington state, often I can plagiarize from their label, and if I just change a few words I can make it seem like my original. They describe Roscoea cautleyoides 'Jeffrey Thomas' as "A selected form from England notable for pale cream flowers which are lighter than typical for the species. We're just over the moon about Roscoeas and this uncommon selection is certainly in the top tier. All the allure of a hardy orchid without the expense. Trouble free pretty much." I don't go "over the moon" like they do, but I did copy their size and hardiness, seeing as how they have grown it longer than I have. We both grow ours in partial shade, so I'm guessing that is what's best for everybody. That Roscoea is in the Zingiberaceae (ginger) family I already knew, but I thought it worth repeating in my description. Another fun plant from Far Reaches is Campanula latiloba 'Alba', a rambunctious bell-flower that I describe as a "A slow spreading perennial with green foliage. 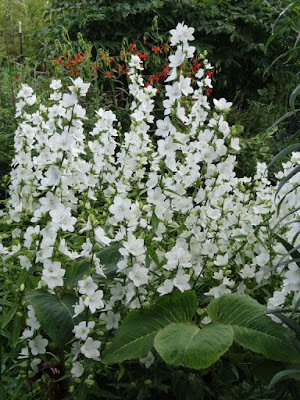 In late spring 2'stems of outward-facing pure white flowers rise above the foliage. 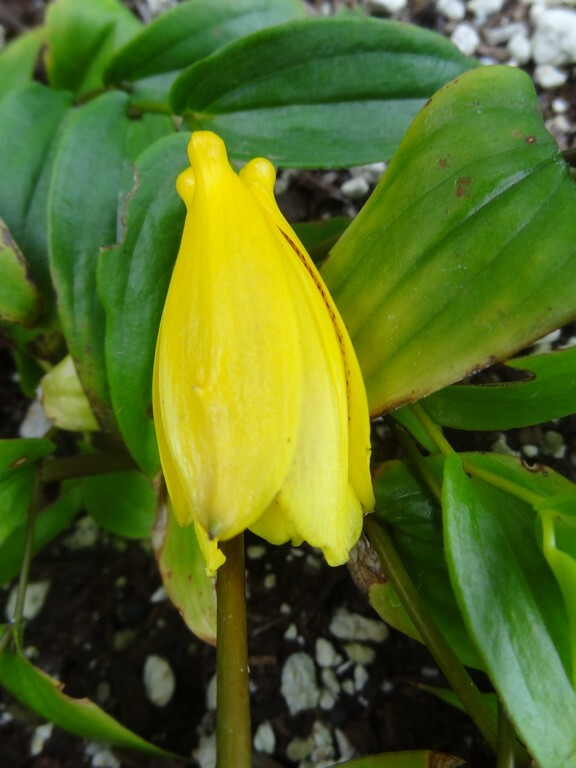 Prefers sun/partial shade in well-drained soil. Hardy to 0 degrees F, USDA Zone 7." I copy Far Reaches and imply that it is "slow spreading," or as they put it "controllably spreading." We are growing it in our relatively small basketball court, and I can see that every year we should reduce its perimeter by about one third. These "controllably spreading clumps" could easily be potted up for sale, but I'm afraid that I'm unknown for Campanula, and no matter how choice it is, I'm not certain that I would find customers. But if you would like a start for free let me know... or better yet: spend the money and buy one from Far Reaches. The botanic name of Tricyrtis macrantha ssp. macranthopsis is a cumbersome epithet, so lets just call it the "Japanese Toad Lily." The photo above doesn't show it but the insides of the funnel-shaped flowers are adorned with brownish-purple dots. The dark green leaves are narrowly lanceolate so they don't get in the way of the blossoms; the tidy fountain blooms in summer, and just so you know the flowers are bisexual. Supposedly it is the mottled coloration of the flowers that gave rise to the common name of "Toad Lily," or maybe since the plant thrives in moist shade, toads were possibly found beneath the leaves. This common name of "lily" is not far-fetched since the genus is indeed a member of the Liliaceae family. We have long had Epimediums in the garden, but I've always resisted the urge to propagate and sell them. Good thing because now there is a gardening craze and new cultivars are popping up all the time. 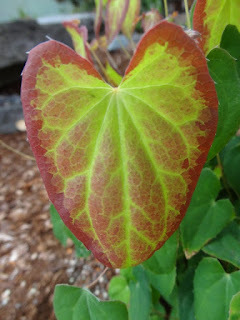 Since we are relatively late to the Epimedium party, we'll let others peddle them and we're content to just grow a few in the gardens. We got to the start of 'Bandit' a few years ago and I describe it as a "Deciduous Asian species forming a clump with small green leaves edged in purple. 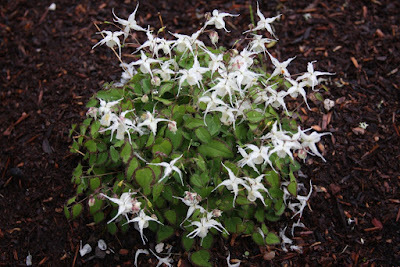 Small creamy-white "bishop's hat" flowers rise above the foliage in May. 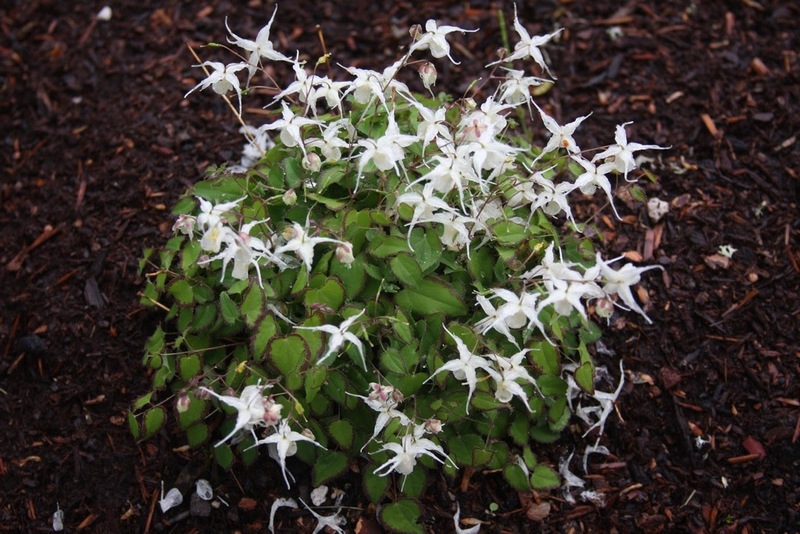 Very cute, from Japan..." I should be precise and list the full botanic name – Epimedium grandiflorum var. higoense 'Bandit' – and the var. 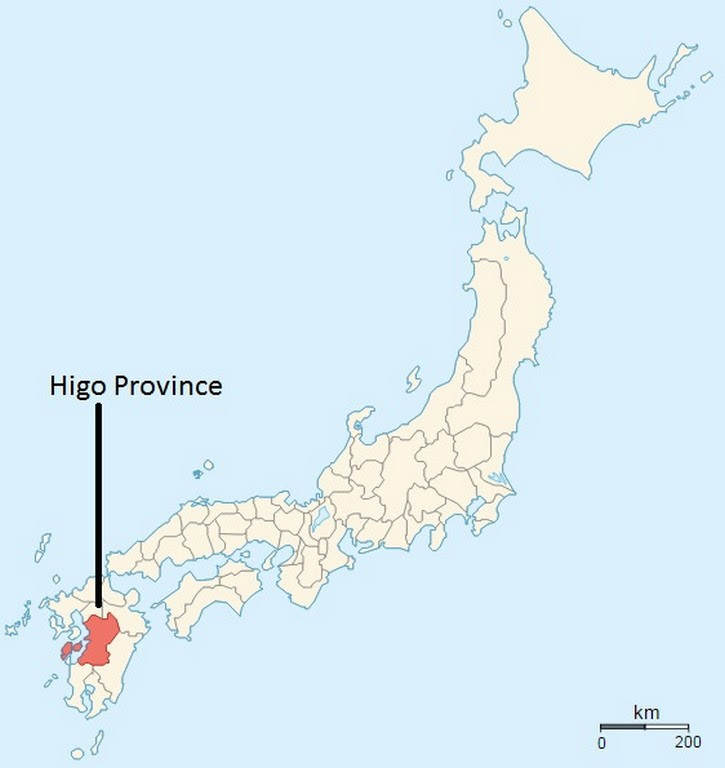 higoense in Japanese refers to Higo* ikariso – the plant name from a location in southern Kyushu, Japan. Grandiflorum is an epithet for "large showy flowers," even though the dwarf 'Bandit's' flowers are too petite for that. Epimedium's name is a mystery, as the genus in the Berberidaceae family is derived from Greek epimedion, from epi + medion, a species of Campanula. Epi is from Greek for "on, at or besides," and, as in epicenter it can mean "outer." 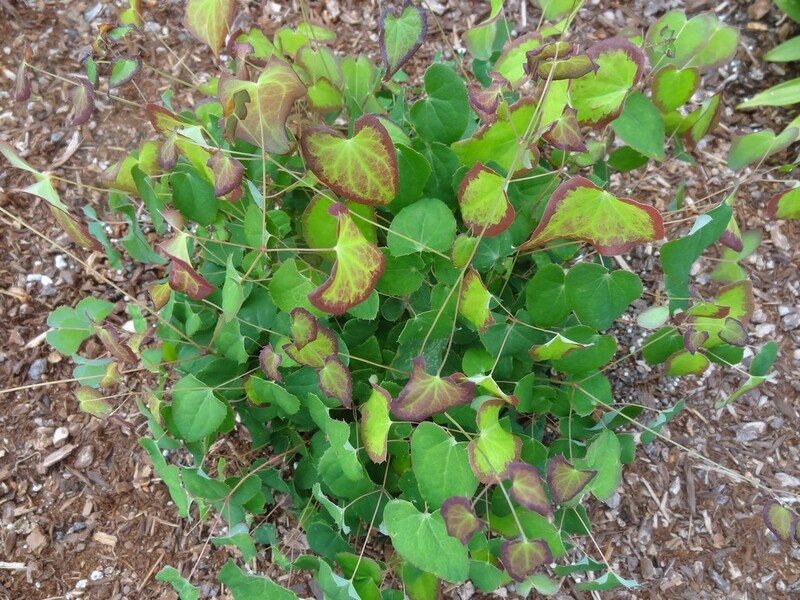 Does the word Epimedium refer to the fact that the flowers are "outside" and hover above the foliage? 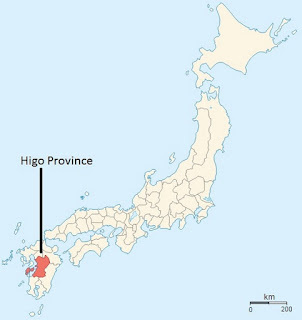 *An ancient denizen of Higo – now known as Kumamoto Prefecture – was known as a stubborn, eccentric person who could never be convinced to change his mind. Fortunately today it means someone with a generous heart that you can take at his word. 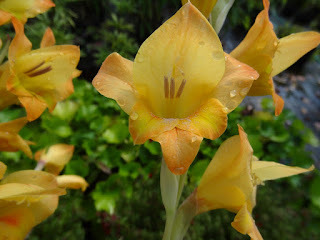 Gladiolus dalenii is – according to me – "An upright perennial with long blades of gray-green foliage. 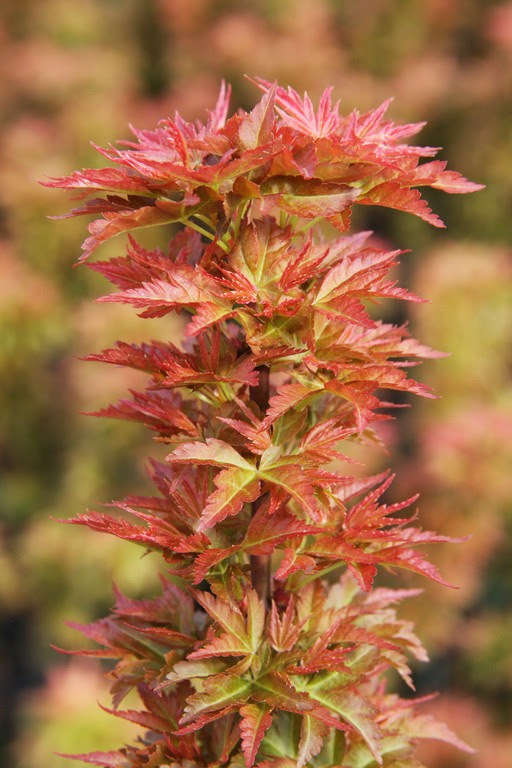 Orange and yellow flowers appear in late summer/early fall. Prefers full sun in a well-drained soil. 3' tall by 1' wide in 10 years. Hardy to 0 degrees F, USDA Zone 7." 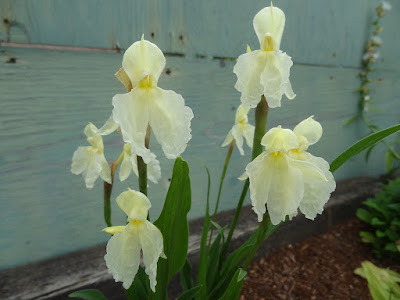 Both of my grandmothers had glads in their garden, so why am I now – 50 years later – bragging about them in my collection? I first acquired G. dalenii from my Grandfather who gave me an extra pot, but even he couldn't remember where his came from. 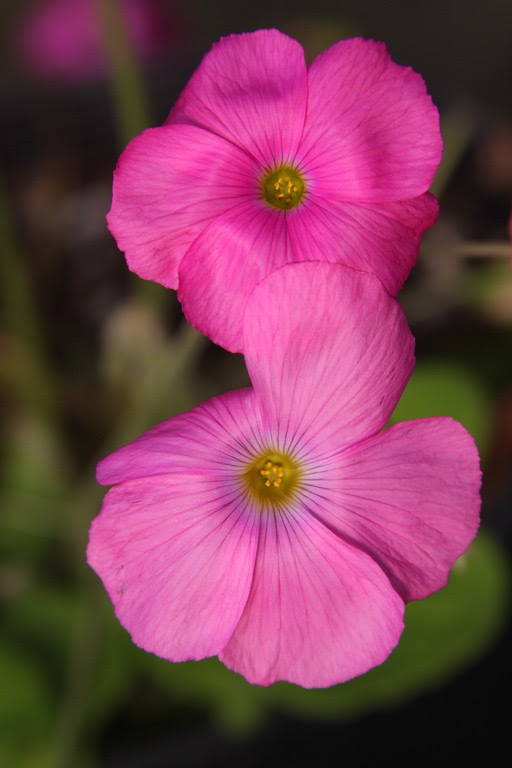 It turned out to be a two-for-one, where Oxalis bowiei was implanted in the same pot. So now one blooms after the other, and both are choice wonderful plants, but I keep my pot inside as neither are reliably hardy in Oregon. G. dalenii ranges from South Africa throughout tropical Africa into western Arabia, and it is a prominent species used in large-flowering hybrids. 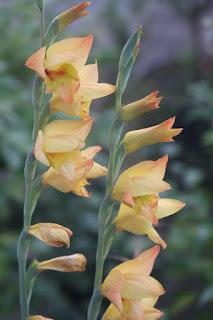 It is commonly known as Dalen's Gladiolus after Dalen van Geel, or Isidwi Esibomvn in Africa. Gladiolus is named after the Latin word gladius meaning "sword" due to the long and pointed leaves. It is not surprising, then, that gladiator shares the same origin, and furthermore it is said that gladiators wore Gladiolus corms around their necks during battles for protection. No wonder that the Gladiolus flower symbolizes strength and integrity, and also not surprising that the genus is a member of the Iris family. And, for you softies out there, the Gladiolus is the August birth flower, and also the 40th anniversary flower because it symbolizes infatuation and remembrance. 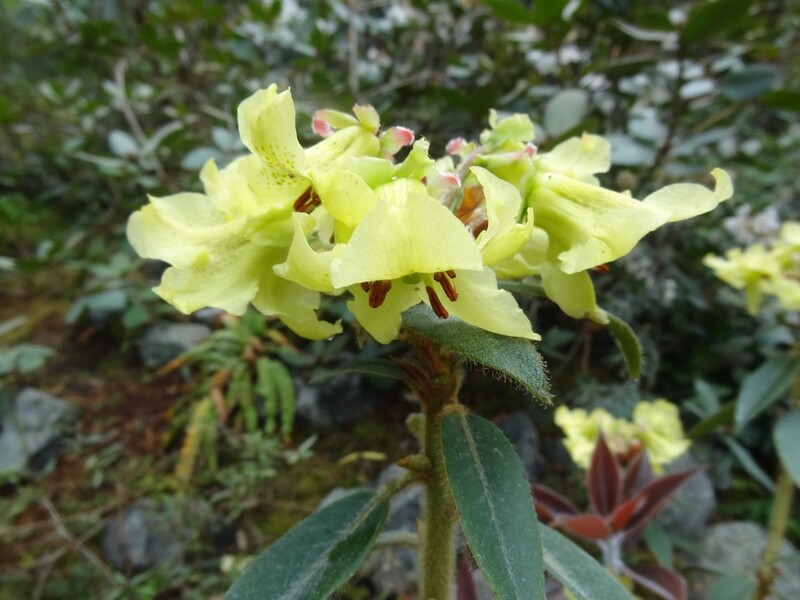 Regular Flora Wonder Blog readers know that I often sing the praises of the Rhododendron Species Botanic Garden in Federal Way, Washington. My visits are a total day's event where nearly eight hours is spent driving the round trip for every two hours in the garden. But there hasn't been a visit yet where I didn't stumble into something new – and it's not always Rhododendrons. A couple of years ago I discovered the ghostly flowers of Ypsilandra thibetica in early spring, and apparently the propagator had great success with them because they were also reasonably priced on the tables in the sales area. 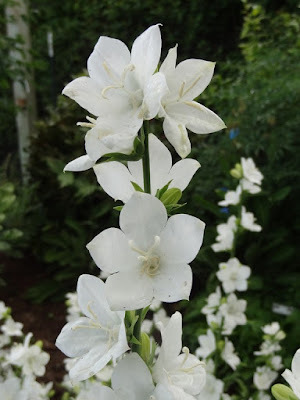 I planted mine in the shade of the basketball court and the frothy white flowers rose about 10" above the evergreen perennial, and did so in mid March when little else was in flower. What is surprising is that Ypsilandra is considered a "new" plant for discerning gardeners, yet it was described by the botanist Adrien Rene Franchet in 1888. Franchet was in the right place at the right time in his position as botanist at the Paris Museum National d' Histoire Naturelle, and he described the flora of Japan and China from collections made by French missionaries Armand David, Pierre Delavay, Paul Farges, Jean-Andre Soulie and others. 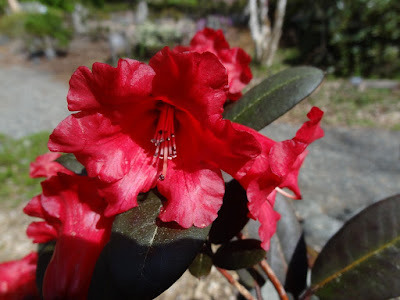 I first saw the intriguing Rhododendron 'Ever Red' at the Rhododendron Species Garden, and it too was offered on the sale's tables. 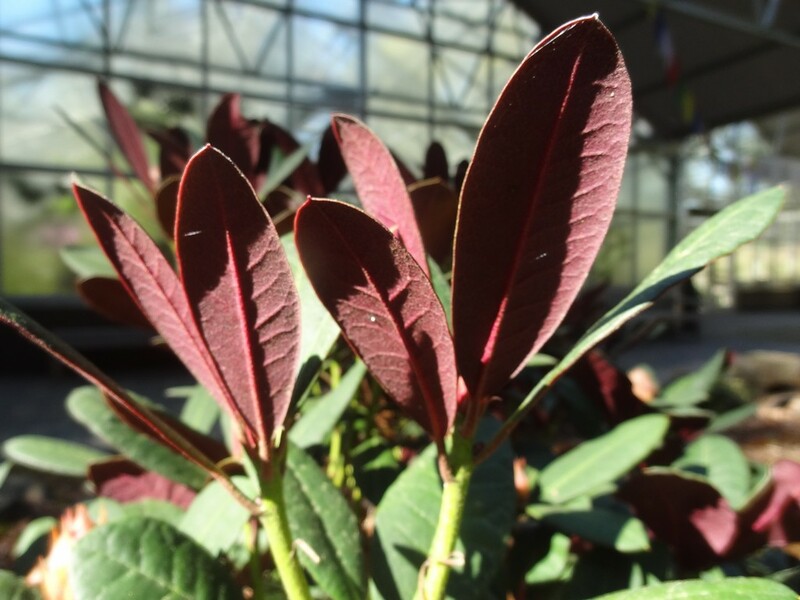 It appears to be dwarf, slow-growing and somewhat leggy when young, but it's leaves – especially on the new growth – are a rich purple-red. 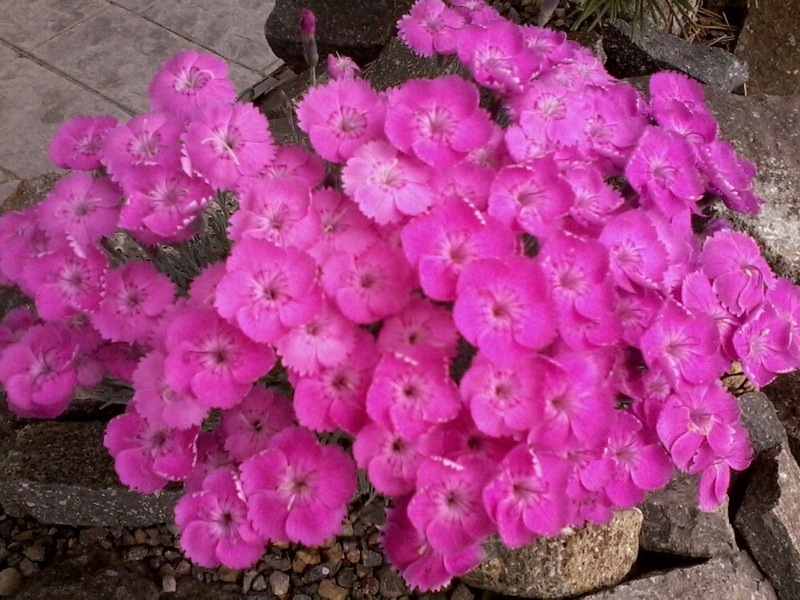 Mine bloomed this spring and I enjoyed the deep red flowers. 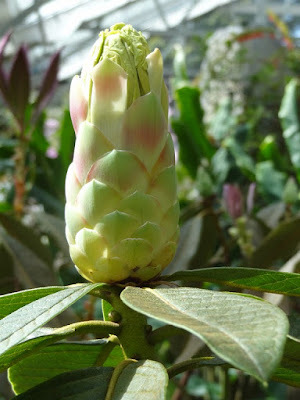 It originated as a hybrid at the famous Glendoick Nursery in eastern Scotland, owned by plantsmen Peter and Ken Cox. It is probably hardy to 10 degrees F, USDA Zone 8, and I find that it performs best with PM shade. Another new Rhododendron that I acquired from the Species Garden is 'Wine and Roses', apparently patented in Europe but free to propagate here. It has a compact form, growing to about 3-4' in ten years. It flowers freely with trusses above the foliage, and the blossoms are bright pink before fading to pale pink. 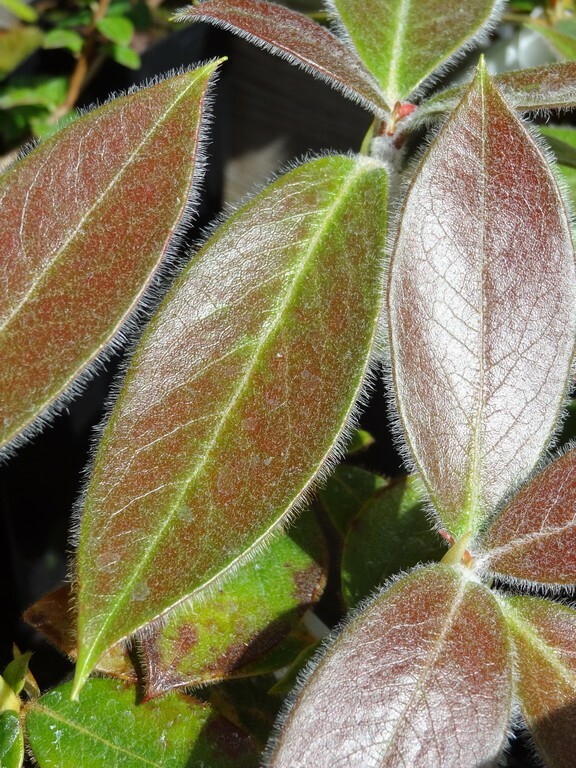 The most spectacular feature, though, is the "wine" color apparent on the leaf undersides, especially when the wind blows. 'Wine and Roses' is also a Glendoick hybrid. I've collected a couple of other Rhododendron species that I encountered in the conservatory at the Species Garden, R. nuttallii and R. boothii. Neither species is hardy so they are housed in my GH20 hot house where I spend lot of money every winter keeping non-profitable plants happy. I love the purple-red new growth on R. nuttallii, and if you're in the conservatory at the right time you will see its large white flowers with yellow throats that are highly fragrant. The best feature for me – since I am a trunk man – is the cinnamon-brown exfoliating bark, the equal in ornamental value to the "Paperbark maple," Acer griseum. 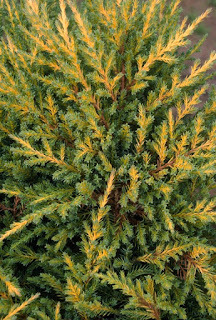 For the non-hardy R. boothii my description reads, "An upright evergreen shrub with an open form. 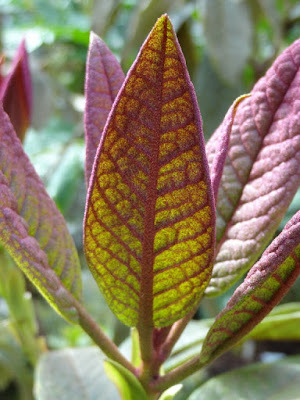 Fantastic copper-red new growth on big hairy leaves. Small yellow flowers in spring. From the temperate rainforests of the eastern Himalaya. Prefers partial shade in a well-drained soil. 4' tall by 2.5' wide in 10 years. Hardy to 10 degrees F. USDA Zone 8." My one plant from the Species Garden is still in a one-gallon pot, yet it produced an enormous flower bud that teased me for a month. Finally it opened, and as I described before, the flowers were small, disappointingly so. Still, the luscious reddish-brown leaves make it a species worth growing. Steve Hootman, Director of the Species Garden, calls R. boothii "virtually unknown." 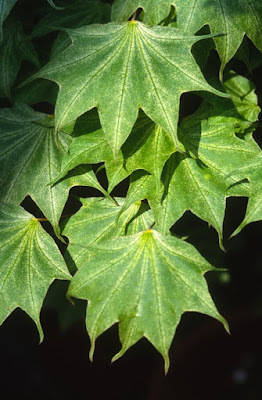 He continues that it is slow-growing and requires excellent drainage, and that he has only seen it in the wild growing on the sides of maple trees, rooted into the bark. R. boothii was first described by botanist Thomas Nuttall (of R. nuttallii fame) in 1853. 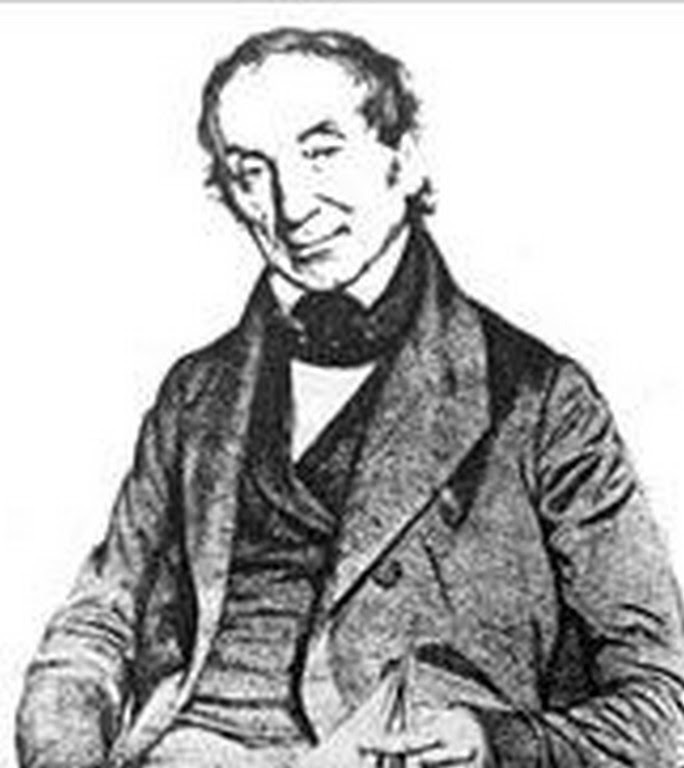 We remembered Nuttall as the English botanist who worked in America from 1808 to 1841. Not only was the Pacific coast dogwood (Cornus nuttallii) named for him, but so was Picoides nuttallii, a woodpecker, and Pica nuttallii, a yellow-billed magpie. Maybe my problem with writing abbreviated label descriptions is that I am naturally long-winded, especially when it comes to plants. Also, I would rather write about plants when I feel like it, not when someone is waiting for a description. Some customers assume that I know everything, and since I sell plants I also owe them a photo or a description. Ultimately the problem is that I sell plants and that compromises all aspects of growing and understanding them, of totally enjoying them.